Cat Yoga! We're not kitten around. Calling all cat lovers ! We’re teaming up with the non-profit organization Tails from the City to bring you the purrfect blend of soft, cuteness and gentle, refreshing yoga - suitable for all skill levels. The kitties will be moving freely throughout the room during class, don’t be surprised if a little ball of fur curls up next to you or climbs onto your yoga pose! Sign up meow for an early bird price of $20. A portion of the proceeds will be donated to Tails from the City - Cleveland to help cover essentials such as rent, utilities, food, vet care, cat litter etc. Anxiety is a feeling of fear, worry, and uneasiness. We all get it, some more and worse than others. In this workshop, we will focus on relieving anxiety and reducing stress by focusing on our breath...mainly our exhales, some standing postures to ground us, and lots of forward bends and restorative poses to quiet our minds and relax our nervous system. Yoga can be a powerful tool for easing these and other symptoms of anxiety, stress, and trauma. With celebrities and athletes like Kevin Love and Carson Daly opening up about their struggles, it gives us "everyday people" the courage to open up as well. So let's talk about it, let's share our stories, let's heal...we are NOT alone! Yoga for Anxiety & Depression with Jill Pawloski - Yoga Instructor will introduce you to a suite of techniques that can help you find peace and calm, including breath (pranayama), movement (asana), meditation, and yoga nidra (yogic sleep) techniques that can help you heal. Anyone can do this, especially after a stressful work day, or whenever you are feeling uneasy. Learn the tools to stay calm and grounded to help you wind down from any type of stress! Open to ALL ages, no yoga experience necessary! Sign up for one or all of these special class offerings! Nicole Casella will guide you, using support of a soft, aerial fabric hammock to help soften, strengthen and align your body. You will do poses both in and out of the hammocks, taking time to explore how the the aerial yoga practice can aid in strengthening your traditional practice. Some benefits of aerial yoga include releasing compression in the spine through anti-gravity postures, deep stretching for improved flexibility and pain relief, gentle and beginner friendly, easier attainment of inversions. Since class is limited to 5 students be sure to reserve a ticket in advance. Join Jill Pawloski one Sunday each month as she continues to provide you with tools to manage your stress. This hour class is designed to assist students in managing and reducing symptoms associated with anxiety, depression, and every day stress. We will focus on simple physical postures and movements, breathing techniques, meditations, and mantras that will help you on your healing journey. We encourage everyone who is taking or has taken the 'Don't Panic! Yoga for Anxiety & Depression' Workshops to attend this class so you can continue to use these tools and techniques to feel better each and every day! There is no pre-requisite in order to join us! Open to ALL ages. Join in on a fun for the whole family yoga workshop! This unique class will introduce you and your child(ren) to vinyasa yoga and meditation in a fun and intriguing way. It is interactive, uses partner poses, and allows for creativity. Kids are welcome to be accompanied by a family member or guardian. -1 adult to every 3 kids please. -Waiver must be filled out by a parent or legal guardian. Please bring a yoga mat if you have one. We have rentals available if needed. Put your jump boots on, turn the music up and let’s move together!! You think you're dancing... but you're also strengthening and toning your abs, back, glutes, quads, hamstrings, calves and shoulders! Ritsa from KangooClubCLE will lead us through a fun 30 minute cardio jump class, then cool down with a gentle Yoga Flow by Roots Yoga. Please arrive 15 minutes early to boot up! Bring tall socks and water. Boots will be provided and rental yoga mats available if needed. Bring your own boots and enjoy $2 off. $20 tickets - Sign up in advance to secure your spot! Would you like to develop a new practice or evolve an existing one? Grab a partner or friend (or come and make new friends!) and join Eton Barrett and Megan Lee to learn and expand upon Acro Yoga skills in a safe environment. This Dynamic Acro Workshop will focus on beginners/intermediate standing skills, concentrating on interesting counterbalances mixed with fun flows to get from one move to the next. Standing flyer positions will promote trust and communication while challenging the partners with intricate transitions. Treat yourself to a well-deserved morning of relaxation and fun at Wine Down & Sweets Cafe. Enjoy an all levels yoga class to rejuvenate the body and mind, then unwind with a glass of wine, mimosa, beer, tea coffee or cupcake. $15 ticket includes yoga and beverage or cupcake. Purchase your ticket in advance to secure a spot! Bring a yoga mat, water and an open mind. See you there! Need relief from the cool weather and short days of winter...? Join us for a Yin & Meditation class + Salve making workshop! Jaimee will lead you through a 60 minute yoga flow to relax the body & mind. After that Nicole will give a informative talk about plant healing and essential oils. We'll all co create a healing salve great for sore muscles & dry winter skin. Everyone gets to take their personal salve creation home. Yin Yoga uses deep stretching to calm the nervous system and provide stress relief. Poses are held longer to work into the deep connective tissues called fascia. During this workshop we will incorporate a meditation practice throughout. After our deep yin sequence we will have a guided meditation + shavasana massage. One of the best ways to receive the healing benefits of plants and treat dry skin, is by the creation of a healing salve. The skin is one of the largest gateways on the body to receive actions of the plants. It is used to heal wounds, rashes, and skin irritations. This time of year, dryness, and irritation can be persistent from the chilly weather and indoor heat. New to yoga? Seeking a deeper understanding of the foundations of yoga? This workshop is for you! We'll cover a brief history of yoga, dive into the yoga philosophy with the 8 limbs listed below, learn correct alignment for fundamental poses, and provide an introduction to Chakras, the energy spheres within the body. Feel free to take notes and be prepared to move around on your mat. If you love the healing benefits of Restorative Yoga, and are curious about Reiki; or vice versa. This workshop is for you!! This healing workshop will begin with a warm restorative yoga session, plus guided meditation. In addition to that, we’ll have an extended shavasana with Reiki healing. Be prepared to restore and relax every edge of your being. This practice will be warm and comfy to aid the body into relaxation. Reiki is a healing technique with Japanese origins. It uses life force energy to aid in stress reduction, relaxation and activates a natural healing process for the body, mind, emotions, and spirit. Restorative Yoga incorporates gentle poses utilizing props for deep stretching and relaxation. Light refreshments and snacks will be available after class. As the holiday season approaches, feelings of gratitude warm our hearts and encourage us to give help to those in need. CoreLife Eatery invites you to give back to the community with us by joining in on a morning of wellness. All donations will go to the Strongsville Food Bank and can include non-perishable food items such as canned goods, peanut butter, jelly, cereal and pasta. Treat yourself to a rejuvenating, free yoga class led by Roots Yoga and enjoy 25% off your meal afterwards! This class is for all levels of yoga and fitness. Please bring a yoga mat and water bottle. Treat yourself to a morning of wellness and rejuvenation at the Architectural Justice Gallery & Café! This Warm Vinyasa class, led by Strongsville's Roots Yoga, will take place upstairs in the Gallery and is great for all skill levels. Must be 21 or older to attend. Space is limited to 22. This event sells out EXTREMELY quickly. No refunds or credits, you can transfer the ticket to someone if you're unable to make it for any reason. Please just send an email giving us your names and the date for our records. Namaste. Enjoy an all levels yoga class to rejuvenate the body and mind, then unwind with a glass of wine, mimosa, beer, tea, coffee or cupcake. Let’s meet up on a Saturday each month for class at The Winchester Music Tavern! Find your center in class from 12-1 p.m. and then enjoy a round of drinks on us. Bottoms Up Yoga & Brew will be partnering with Roots Yoga Studio each month to host this class. We’ll be featuring a fresh genre of music each week. Bring your friends! Join us for an all levels, all ages vinyasa flow under the sun every Tuesday until the end of September (and weather permitting). Bring a Yoga Mat, water and an open mind and meet us in the Parks! Class will be led by Diane Speer, the director of our upcoming Yoga Teacher Training. Diane is a yoga and meditation teacher trainer and holistic lifestyle consultant with 25 years of experience providing certification programs and lifestyle enrichment training for personal and professional development. 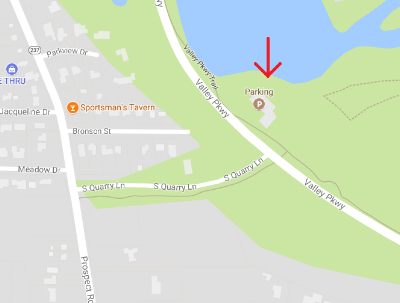 We'll be at the same location as before: the South Quarry picnic area in the Metroparks, located at the intersection of South Quarry Lane and Valley Parkway. You can park in the lot shown in the map, and you'll see us in the grassy opening. Join us at CoreLife Eatery for a core strengthening yoga class led by Jill Pawloski. Enjoy a meal of your choice afterwards, included with the ticket! The core consists of the muscles in the abdominal wall, but also includes the obliques, pelvic floor, gluteals, and the lower back muscles that support our spine. A strong core can improve posture, aid in digestion, and reduce back pain! You will be lead through an hour of floor exercises and yoga poses that will build these core muscle groups and will help condition your core, sculpt your body, and burn calories. This class is for all levels of yoga and fitness, guarantees a great workout set to upbeat motivational music, and will leave you sweaty and strong! Roots Yoga invites you to an entire week of specials and events!! This is our way of saying THANK YOU to everyone who makes our space so special and to introduce new faces to the studio. If you like yoga, free stuff, family fun, health and wellness - join us, we can’t throw this party without you! Please bring a mat and water for any yoga classes, mat rentals are available. Email us at rootsyogacle@gmail.com with any questions. We're eternally grateful for all the love and support the Strongsville (and beyond) community has shown us in our first year of business, thanks for helping us keep these warm doors open! Have you been curious about the benefits of being in a salt spa? The relief it provides for the lungs, allergies, skin and overall wellness are immense. We're pairing all of that with the benefits of a Yin yoga class to bring you an ultimate hour of healing and rejuvenation. This relaxing Yin yoga class helps heal and nurture the body and mind. Using deep stretching to calm the nervous system and provide stress relief. Poses are held longer, working into the deep connective tissues called fascia, and incorporating a meditation practice throughout. When Halotherapy is paired with a fitness routine it improves stamina, increases endurance, enhances lung capacity, detoxifies the lungs, and helps you breathe easier. Join us in the Halotherapy room and experience an all new level of relaxation! Bring a yoga mat, water and get ready to relax. If you do not have a mat, we'll have a few extras to borrow. Space is EXTREMELY limited for this event, so be sure to register in advance! Please contact us at rootsyogacle@gmail.com with any questions. Learn about the basics of crystals and crystal energy healing. Created over the millennia in the earth, healing crystals contain the life-giving elements of the Earth and the universe accumulated and contained in the crystals over vast expanses of time. You will learn about basic crystals that are easy to use for every day practical and personal proposes. Take home your very own crystal healing kit - included with the ticket. Join us for a FREE morning of wellness and relaxation. This all levels flow class will be out in the grassy field next to the Briarwood Lodge. All ages and skill levels are welcome. Class will be held outdoors so dress for the weather in comfy clothes. Bring a mat or a towel and water. If you don't have a mat we'll have a couple extras available to borrow. In the event of a rain out, class will be held at Roots Yoga Studio. Briarwood Lodge is entered off of Briarwood Drive which is off of West River Road about 1-2 miles south of Royalton Road (Rt. 82). Please note: The lodge cannot be accessed by vehicle from main entrance on Royalton Road. The driveway and parking lot are gravel. This class is free to the public but donations are always welcome. If you'd like to donate you can before or after class. No donations to be made on park property. For some reason the map locator in the link is showing an inaccurate location for Briarwood Lodge. It is showing it near the intersection of West River Road and Briarwood Lane, but it is actually further east on Briarwood Lane to almost where the road makes a hard right. Please see the attached park map. There is a small sign at the entrance. Join Jaimee from Roots Yoga for a 60 minute all levels vinyasa flow on the patio! We’ll be on the patio of The Hooley in Mentor once a month all summer long. After class, treat yourself to a complimentary Mimosa, Bloody Mary or Craft Draft! Bring a yoga mat, water & an open mind. We’ll have a couple extra mats available if you need to borrow one. If the weather is not cooperating we’ll have class indoors. Full menu and extra cocktails available for additional cost. Treat yourself to a morning of wellness and rejuvenation at the Architectural Justice Gallery & Cafe! This warm vinyasa class, led by Strongsville’s Roots Yoga , will take place upstairs in the Gallery and is great for all skill levels. Space is limited to 22. Please bring a yoga mat, water and an open mind. If it rains, class will be held at The Winchester. 12 - 1 pm Yoga Basics (all levels) music inspired yoga class in Lakewood's iconic music venue! Full bar and Brunch menu available for additional cost. Start your day feeling refreshed and energized. The class will be held in the beautiful back patio overlooking the Mill Stream Run waterfall (weather permitting) at Docere Medical Spa & Laser Center. It will be an all levels flow style led by Strongsville's Roots Yoga. No yoga experience is required. Please wear loose, comfortable clothing, bring a yoga mat and a water bottle. Sign up in advance to reserve your spot! Interested in learning how aromatherapy can deepen your yoga practice...? Come to this master class in our series of workshops introducing Diane Speer. She will help you transform your yoga practice with a gentle asana practice enhanced with essential oils. The use of essential oils during our practice supports healthy body-mind function, energizes your yoga postures, provides clarity of mind, and relaxation into bliss. Learn which oils and scents work best for your personal practice and needs. Diane will be leading a Yoga Teacher training at Roots Yoga, starting in September 2018. She is here to teach and get to know our yoga community. Help us welcome her to the Roots Yoga family! Please bring a yoga mat and some water. Mat rentals are available at the studio. Presented by: Way to Wellness - Diane Speer is a yoga and meditation teacher trainer and holistic lifestyle consultant with 25 years of experience providing certification programs and lifestyle enrichment training for personal and professional development. Join us at Roots Yoga for a series of free classes this summer. The classes are an all levels warm vinyasa flow style. They will be led by Diane Speer, the head of our upcoming Yoga Teacher Training. Diane will be available before and after class to answer questions and explain the benefits of the teacher training program. Light refreshments will be available. Please bring water & a yoga mat. Mat rentals are available. Suggested donation is $15; no one will be turned away for lack of funds.